By John C. Toman. Posted November 19, 2011, 3:46 PM. The first of two storms passed with just some raindrops and gusty winds on Saturday. The second, stronger storm is right behind it, and should arrive by Sunday afternoon. That one is sliding down the coast, much like the storm system from a week ago, and will pass mostly over Baja California. 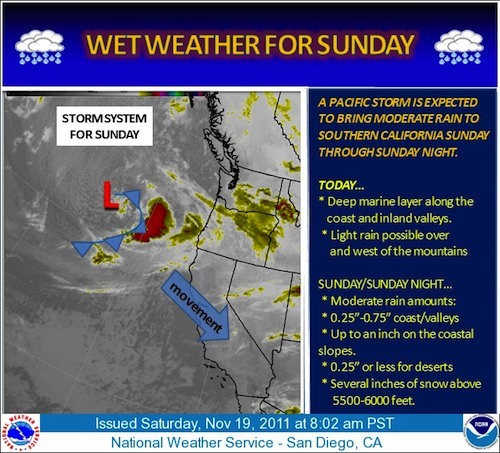 "The strongest portion of the system moves through beginning late Sunday afternoon and continues Sunday night", said Jim Purpura, WeatherCurrents' meteorologist. "Expect about a quarter of inch of rain in most locations, with some places seeing up to a half of an inch." Snow levels are expected to fall to near 5,000 feet Sunday night, but little accumulation at that level is anticipated. Lingering showers should end Monday morning, with clearing expected the rest of the day. Another storm is lined up for Thanksgiving Day. Sunday's storm has been tricky to forecast, primarily because the three weather models had been in disagreement over track, timing and intensity for much of the past week.